1. It Opens Next Year! – Opening date is currently set at 2019. 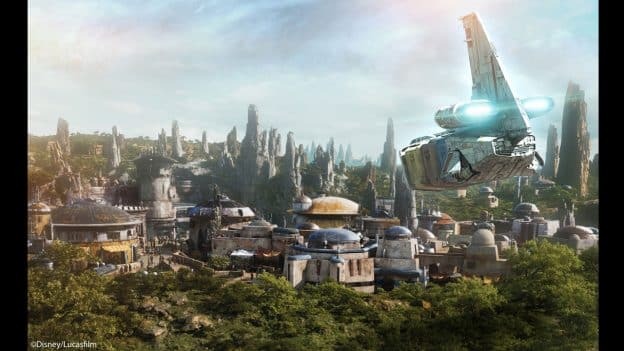 Star Wars: Galaxy’s Edge at the Disneyland Resort will debut first and the land at the Walt Disney World Resort will debut second. 2. 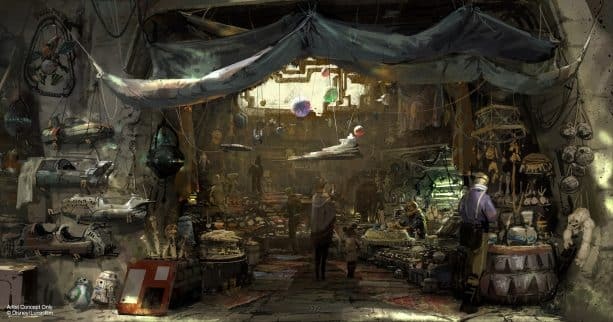 It’s Set On The Planet Batuu – At Star Wars: Galaxy’s Edge, guests visit Batuu, a remote outpost on the galaxy’s edge was once a busy crossroads along the old sub-lightspeed trade routes, but its prominence was bypassed by the rise of hyperspace travel. Now home to those who prefer to stay out of the mainstream, it has become a thriving port for smugglers, rogue traders and adventurers traveling between the frontier and uncharted space. It’s also a convenient safe haven for those intent on avoiding the expanding reach of the First Order. (See rendering at the top). 3. 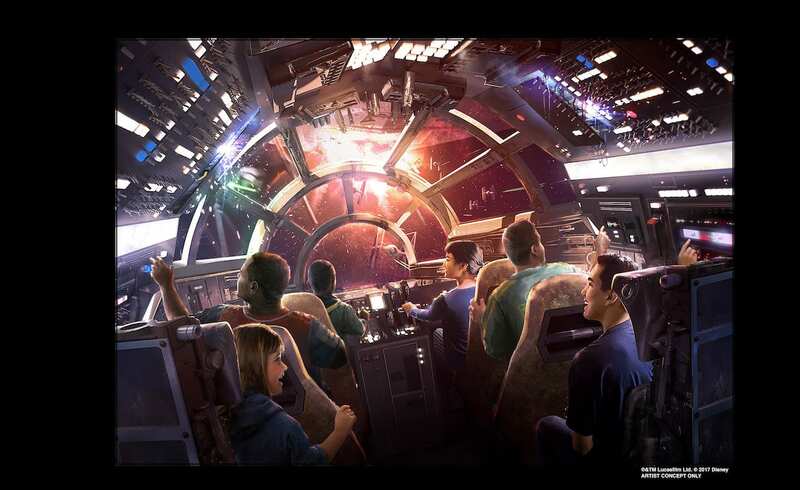 You’ll Be Able To Fly The Millennium Falcon – One of the land’s two signature attractions will put you in the cockpit of the Millennium Falcon, piloting the ship, shooting blasters or preparing for hyperspace – all while completing a critical mission. But how you perform on the mission holds even bigger stakes: perform with skill and you may earn extra galactic credits, while bringing the ship back banged up could put you on the list of a bounty hunter. End up on Harkos’s list and you may face a problem if you show up at the local cantina. 4. 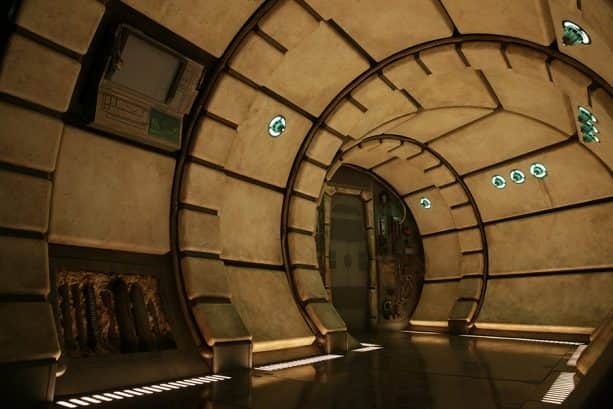 A Second Attraction Planned for Star Wars: Galaxy’s Edge Puts You On A Star Destroyer – This attraction, “built on a scale we’ve never done before,” will make guests feel like they’re inside a hangar bay in the middle of a battle between the First Order and the Resistance. (The name of this attraction is still yet to be released). For the latest on Star Wars: Galaxy’s Edge, be sure to bookmark our dedicated Star Wars content page. I’m planning on taking my family on Spring break 2019, will Star Wars land in California be open at this time. We are very excited to see all of the new attractions and are huge Star Wars fans! Do you think it would be open by September 2019 ? What happens to star tours when the new Star Wars land opens? I hope it is not going away. My family really likes it! Is there an estimate date for opening or expected date to announce when will open please. We are planning on our 2nd visit Oct 2019 and will be dreadful upset if not opened by then. Otherwise may postpone until 2020. Can someone point to a specific date for opening of the new section in 2019, we are wanting to plan our vacation soon and would like to know more details. When will Disney be more specific about this??? 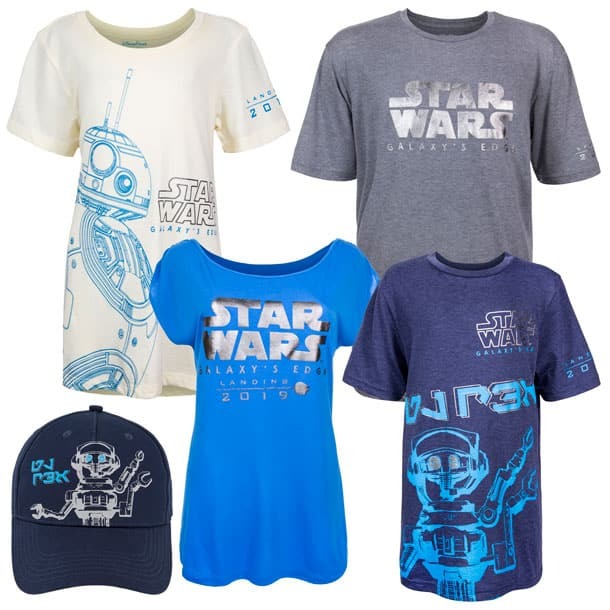 Planning a vacation to WDW for the New Star Wars theme park, can you advise 1. What park this is going to be in 2. what month of 2019 this will open as coming in from the Uk I would not like to miss this park as huband and family are huge Star wars fans. Many thanks. Anyone know more specifically when they plan on opening the new Star Wars land in 2018? In the galactic nights video, they talked about trading cards, when will these be released in Anaheim and is there more info on how many sets there will be? When will opening day for WDW HS be annouced? It is hard to plan a vacation far out to get cheapest and best resort/vacation package without an opening date. 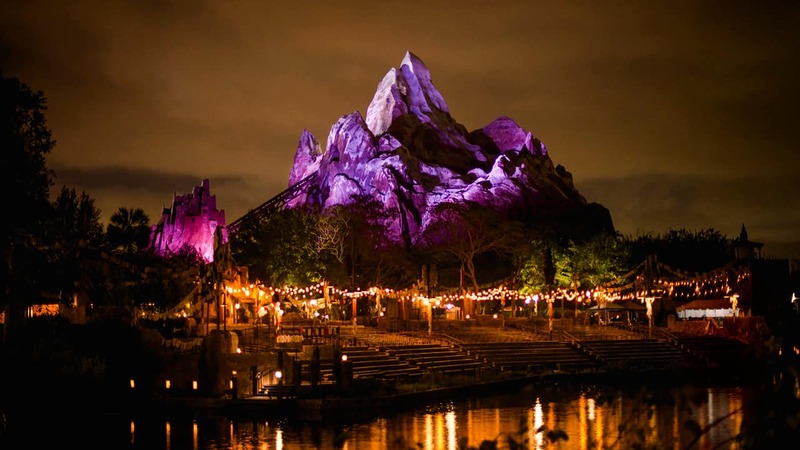 I am planning a Disney vacation for the summer of 2019, when would I be able to book a package staying at this resort?? But, I want it now!!!!!! On the edge of my seat in anticipation. I’m very excited for Galaxy’s Edge to open at Disneyland. A portion of the model is on display in the Star Wars Launch Bay in Disneyland’s Tomorrowland. Going to WDW next November. Star Wars will not be open then. However, Pandora an HOP will be open. Missed them both on our trip in May. Been going to WDW since 1974. We go down at least once a year and there always seems to be something new every time we go. Just love it.